If you live in Spicewood or the surrounding area and need a trusted veterinarian to care for your pets – look no further. Dr. Brady J. Bennett is a licensed TX veterinarian, treating all types of pets. Your pets’ health and wellbeing are very important to us, and we take every possible measure to give your animals the care they deserve. Spicewood Vet Clinic & Mobile Care is a full-service animal hospital that offers house call appointments and welcomes both emergency treatment cases as well as pet patients in need of routine medical, surgical, and dental care. Dr. Brady J. Bennett has years of experience treating serious conditions and offering regular pet wellness care. Beyond first-rate pet care, we make our clinic comfortable, kid-friendly, and calm, so your pet can relax in the waiting room and look forward to meeting our Spicewood veterinarian. We are happy to offer a number of resources that enable you to learn about how to take better care of your pets. Please feel free to browse our site, particularly the informational articles. The best veterinary care for animals is ongoing nutrition and problem prevention, so becoming knowledgeable about preventative pet care is essential to the ongoing success of your animal’s health. If you have any questions, call (512) 731-3093 or email us and we'll promptly get back to you. Our Spicewood veterinarian office is very easy to get to -- just check out the map below! If a house call is more your style, we travel to Spicewood and the surrounding area. We also welcome you to subscribe to our newsletter, which is created especially for Spicewood pet owners. At Spicewood Vet Clinic & Mobile Care, we treat your pets like the valued family members they are. Our mission is to provide the highest quality of medicine and surgery to our patients. Every day is an opportunity to impress our clients with our enthusiasm, expertise, and quality of care. We will build trust and exceed expectations by advocating for the pet, educating our client, and treating each as though they are our only appointment all day. Dr. Bennett was born in a small town in the Midwest. He attended undergraduate college at Illinois State University and graduated from veterinary school at the University of Missouri in 2009. Dr. Bennett and Kristin met while working at an animal emergency hospital during college and have been together ever since. Dr. Bennett was born in a small town in the Midwest. He attended undergraduate college at Illinois State University and graduated from veterinary school at the University of Missouri in 2009. 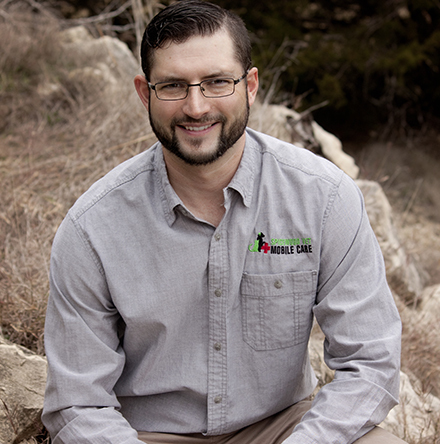 He has been practicing in the Hill Country for 6 years before starting the Spicewood Vet Clinic – Mobile Care in 2015. He really enjoys emergency medicine and works several shifts each month at the Emergency Pet Care Round Rock. He is married with two children. His hobbies include: training Belgian Malinois and fun family activities when not working with patients. Dr. Bennett and Kristin met while working at an animal emergency hospital during college and have been together ever since. Her duties include helping as a veterinary technician, marketing, and administration. Amy entered the veterinary field three years ago. Her duties with SVC include veterinary technician and customer service. 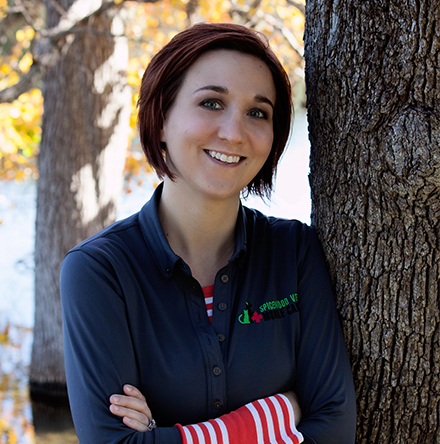 She was raised here in Spicewood and has extensive experience working with animals in our community. She is married and her husband Maurice is currently serving in the Army. The Robinson's have a chocolate lab and one seriously ornery kitty. Concierge Pet Care - We bring veterinary services to your home to provide convenience for our clients and comfort for your pet. "Dr. Bennett is so awesome! I am so amazed by his integrity and ability. We used to have Dr. Meyers in south Austin for years. The very most top notch old school knowledgeable vet ever, and conservative with his charges but he's so far away from us. Went through at least 5 different vets out here till we found Dr. Bennett. I'm very impressed and that's something to be said. Dr. Bennett is my choice of vets!" "My lil Robin(85lb) is so shy that she freaks out at every vet's visit. Everyone was so helpful and patient made the experience so much better for both of us." "I'm so grateful to have professional and caring people to care for my fur babies. Dr. Bennett and Amy respond quickly to your needs. I think what sets this practice apart from others is complete access to your vet. I also feel that your animal being treated in their home is less stressful. I can't complement this team enough. Thank you for establishing your practice in Spicewood. We are blessed to have you."